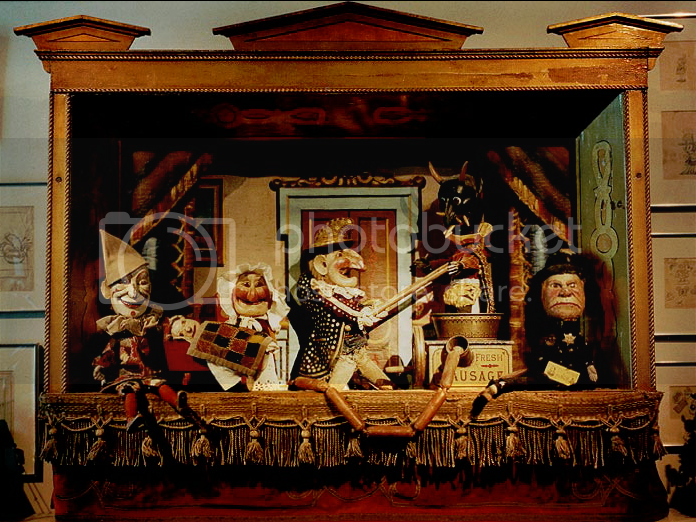 vintage toy collector Mel Binkrant's website. 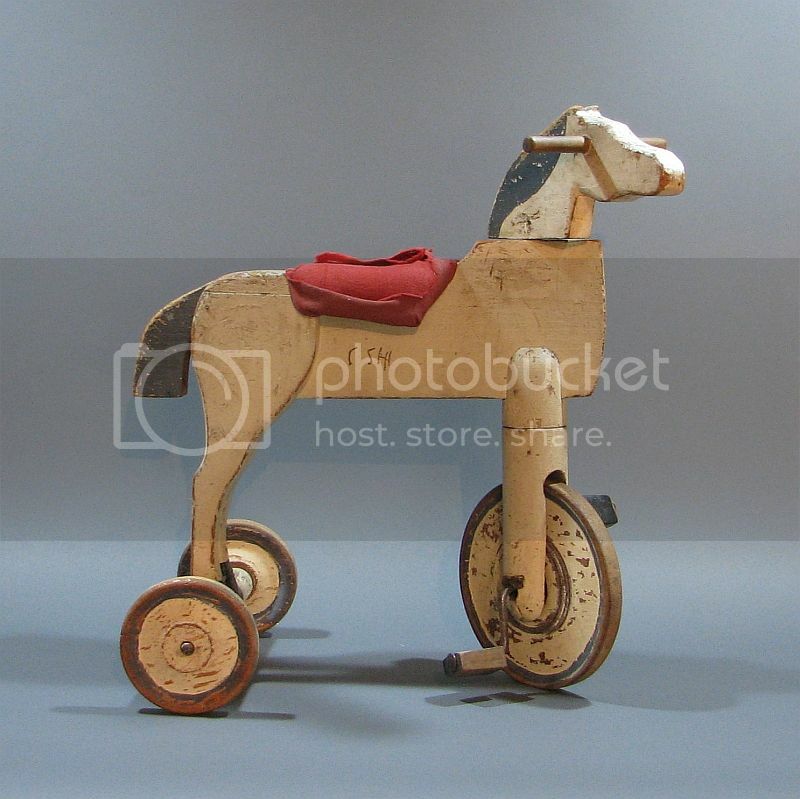 An early-20th century pedal horse is a favorite vintage toy from my own Playful Plans collection! This charming riding toy was carefully fabricated in some forgotten woodworker's shop, perhaps for a young family member. It's design is so sturdy that kids visiting my own workshop continue to pedal it happily around in circles! Although the painted details and fabric saddle are aging and there are cracks and repairs here and there, this pony's simple, dignified appearance and playful action captivate everyone who sees it. 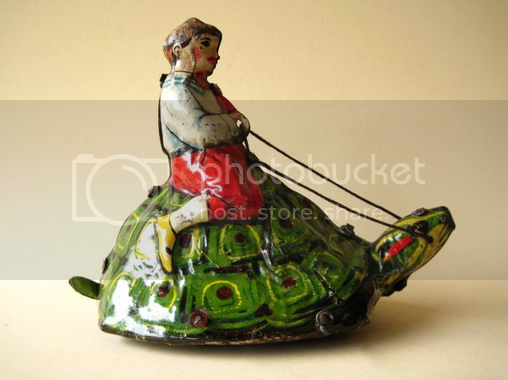 Although made from tinplate rather than wood, this wonderful key-wound boy riding on a turtle always makes me smile! Something about the imagination of the designer, it's colorful appearance and the absurdity of a child guiding a turtle by the reins makes this one of my favorite toys of all time. While eBay features thousands of vintage toy auctions weekly, it is just one option when you're looking for a special toy from your childhood or simply exploring what's out there. I've discovered some of my favorite classic toys in the dusty corners of second hand shops and benched at outdoor flea markets. Local and regional papers and classified ads offer possibilities, but require a lot of followup driving that may test your patience when the actual finds don't match descriptions! I recommend three online auction houses that specialize in vintage toys, where you'll find the complete focus on quality examples that are often lacking on eBay. Their reputation and expert curators also ensure you'll be getting honest descriptions and the most value for your investment. Morphy Auctions is excellent and I have enjoyed bidding on (and sometimes winning!) wonderful vintage wooden toys there. Bertoia Auctions is also a reputable auction house. My third suggestion is Noel Barrett Antiques & Auctions. 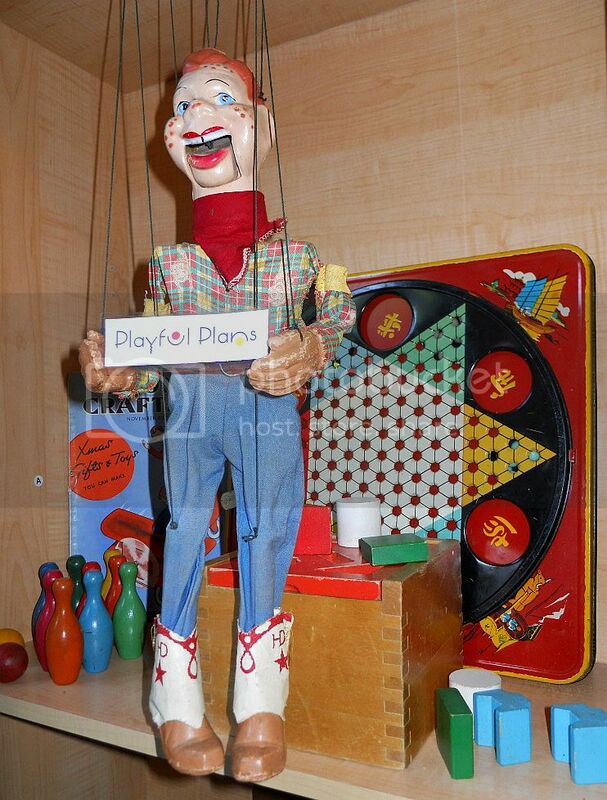 Here is a photo of my 1950's Howdy Doody marionette won at a Morphy's auction, and links to all three auction houses. Good luck! Did you enjoy this blog? Read more about why we love vintage toys.